JAMESTOWN – On Sunday, May 20, 2012 at 7:00 p.m., The Swenska Spelman Swedish Gammaldans Group will perform at the Music Salon Series at the Unitarian Universalist Congregation of Jamestown. Svenska Spelman is a traditional Scandinavian gammaldans (barn dance) group based in Jamestown, NY. We have been together for over ten years. Svenska Spelman is the host band for the Jamestown Scandinavian Festival, and accompanies the Thule Lodge Folk Dance teams. They have performed in Budd Lake, NJ, Mt. Jewett & Warren, PA, Cleveland, OH, and were featured performers at the 2010 Vasa Lodge Grand National Convention at the Swedish Embassy in Washington, D.C. 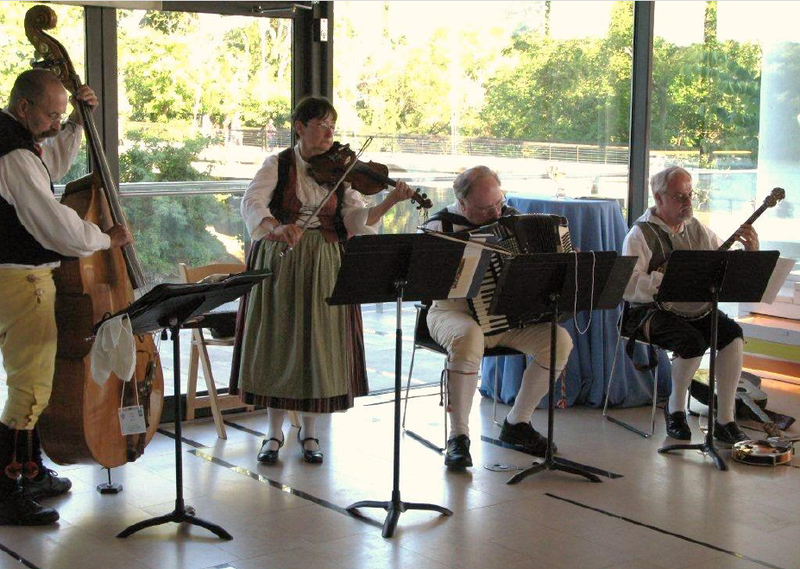 They were also honored to play for the King and Queen of Sweden during their visit in October of 2011 celebrating the 100th Anniversary of the Jamestown Norden Club. Don Sandy, our accordion player, has been playing the accordion most of his life. His passion for the music of his Swedish family led him to collect an astonishing library of sheet music, which has served as the basis for Svenska Spelman’s repertoire. Don was raised in Jamestown, and worked for many years for Lutheran Social Services. He now is a representative for Thrivent for Lutherans. Don has served the community in countless ways, including his tireless role as director of the Jamestown Scandinavian Festival, now in its eleventh year. In late 2001, Kathy Howard Petersen and her daughter Hannah, both fiddle players, became acquainted with Don. They had been playing old-time contra dance music & Celtic tunes for many years, but were looking for Scandinavian music, as Hannah’s father’s heritage was Danish. Thus Svenska Spelman was born. Despite the untimely passing of Hannah in 2010, the band has remained committed to the preservation of traditional Scandinavian dance music. In 2003, Tim Cudney joined up on bass, and several years later, the addition of Tom Gestwicki on guitar, mandolin, and tenor banjo completed the band. Over the years, personnel changed a little, but the core group stayed. Svenska Spelman has played for church services, weddings, funerals, parades, Midsummer celebrations, birthday parties, and festivals. We never lose our love and enthusiasm for the music we play, or, more importantly, the people we play for! This program is part of the continuing Music Salon Series provided by the Unitarian Universalist Congregation of Jamestown. Funded in part by the New York State Council on the Arts Decentralization Re-grant Program administered by the Cattaraugus County Arts Council. Donations will be accepted to insure the continuation of the salons, and a reception will follow the performance. The Unitarian Universalist Congregation of Jamestown is located at 1255 Prendergast Avenue in Jamestown. For information, call (716) 488-1902 or email uucj@windstream.net.